Imphal, February, 2108 (DIPR): Shija Hospitals and Research Institute Pvt. Ltd. and Sun and Sands Enterprises Pvt. 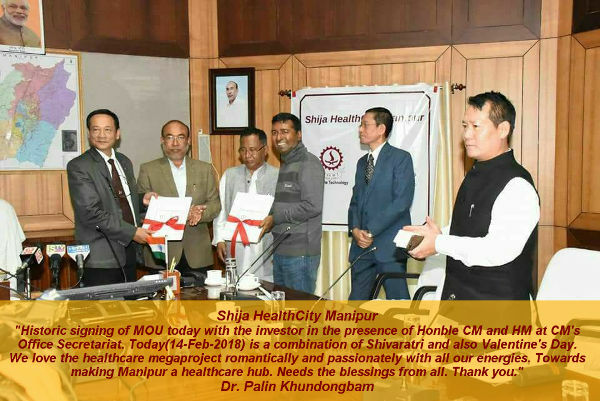 Ltd. singed a historic MOU for the development of ‘Shija HealthCity’ in Manipur. The historic agreement was signed in the presence of Chief Minister Shri N. Biren Singh which was held at Chief Minister’s Secretariat today. Speaking on the occasion, Chief Minister Shri N. Biren Singh said that such historic moment is an outcome of the NorthEast Development Summit 2017(NEDS 2017). The government is trying its best to execute a number of MOUs with outside investors in the comings days. After the NEDS 2017, many investors are visiting the State to invest their money in various sectors. He further said that we need to encourage private sector as we can’t accommodate everything in the government sector. We have to encourage PPP model for the welfare of the people. He maintained that such MOU would definitely help those poor and needy people of the State. Chief Minister congratulated and gave his best wishes to the Shija Hospitals and Research Institute Pvt. Ltd. and Sun and Sands Enterprises Pvt. Ltd. for signing the historic MOU. Briefing at the gathering, Dr. Palin Kh., CMD of Shija Hospitals said that Manipur have all the opportunities like human resource, geographical advantage, India’s Act East Policy, Tourism, Powerhouse of Sports and there is a huge demand of our nurses and paramedics in countries like Japan and Singapore. Mentioning that over 700 Manipuri students are undergoing MBBS course in foreign countries, Dr. Palin said that Manipur needs a compensatory exponential infrastructure development in healthcare delivery system to prevent the huge economic drainage from the State due to the healthcare and health related education and rather attract more medical tourists and students from the country and abroad. Singing of such MOU would bring a paradigm shift in the healthcare scenario of the state, he added. Shri Rahul Narvekar, CEO of Sun and Sands Enterprises Pvt Ltd. assured that his company would build 100 start-up entrepreneurs from Manipur. He mentioned that Manipur has huge potential in medical tourism. Mentioning that Manipur has largest number of trainied nurse in the country after Kerala, he stated that if we provide Japanese language training to them then they could easily get employment in Japan. Shija HealthCity Manipur is a 200 acres mega project with an estimated project cost of about Rs.3,500 crores. The objective of the project is to bring an inclusive growth based on the healthcare and education. 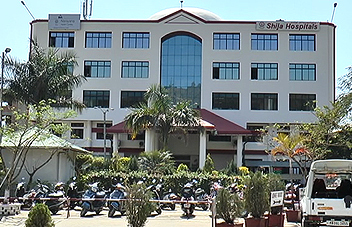 Major features of the Shija HealthCity Manipur are 2300 bedded hospitals, Medical College up to 250 students intake, Dental College, Nursing College, Hotel & hospitality management institute, Cancer Hospital, Drugs and surgical consumable manufacturing plants, Residential Complex, Shopping complex, Ambulance including Helicopter Services etc.